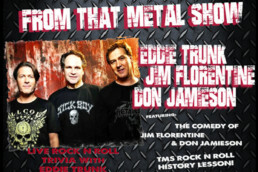 From That Metal Show LIVE is a live show hosted by Eddie Trunk with co-hosts Jim Florentine and Don Jamieson. The tv show I premiered on VH1 Classic on November 15, 2008. New episodes air on VH1 Classic on Saturday nights and are rebroadcast throughout the week. Discussions on the show focus on “all things hard rock and heavy metal”, past and present. Among the regular segments are round table discussions between the three regular hosts, top-5 debates, interviews with heavy metal musicians, “Stump the Trunk,” where audience members ask provided trivia questions of host Eddie Trunk in hopes of acquiring prizes, and “The Throwdown,” where the hosts and guests vote on and debate great moments and figures in metal history. The guitar & bass-heavy theme song, “Day to Remember” was co-written by co-host Jim Florentine and Guns N’ Roses lead guitarist Ron “Bumblefoot” Thal and performed by Thal. The intro to “Stump the Trunk” was composed by Mark Fain.